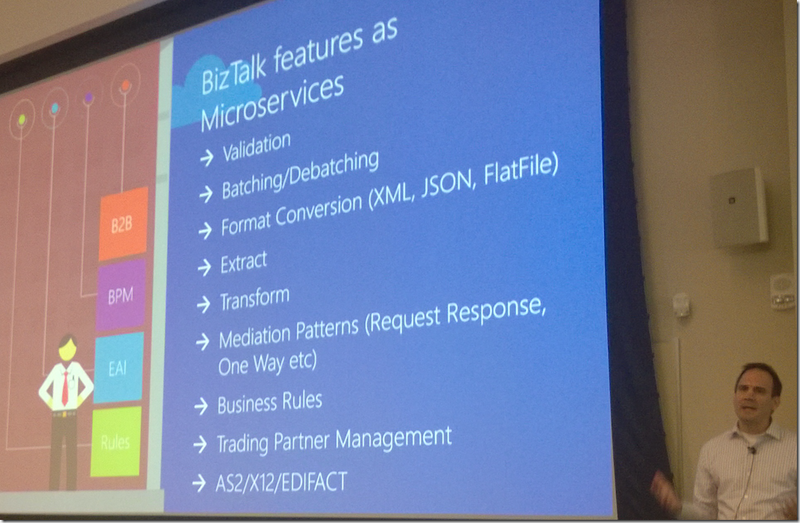 BizTalk Microservices: A Whole New World – Or Is It? NOTE: I’m still processing all of the information I took in from Day 1 at the Integrate 2014 conference here in Redmond, WA. This post represents a summary of the first day with some thoughts injected along the way. This morning was a morning of great changes at Integrate 2014. It kicked off with Scott Guthrie presenting the keynote session without his characteristic red shirt – a strange omen indeed. He brought the latest news from the world of Azure and touted the benefits of the cloud alongside the overall strategy and roadmap. After his presentation concluded, Bill Staples (unfortunate owner of the bills@microsoft.com email address) took the stage and presented the new vision for BizTalk Services. NOTE: Since there are a lot of places linking directly to this post, I have made factual changes in light of new information found here. Microsoft Azure BizTalk Services, still very much in its 1.0 iteration is undergoing a fundamental change. 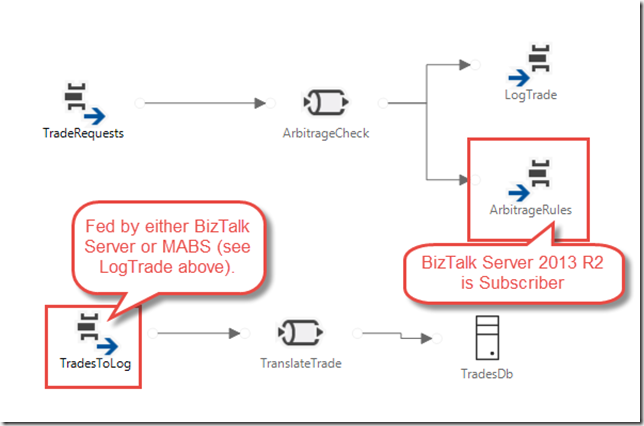 Instead of providing the idea of a bridge tied together with other bridges in an itinerary, the actual bridge stages themselves – the raw patterns – are being extracted out and exposed as Azure BizTalk Microservices aligned with a microservices style architecture. 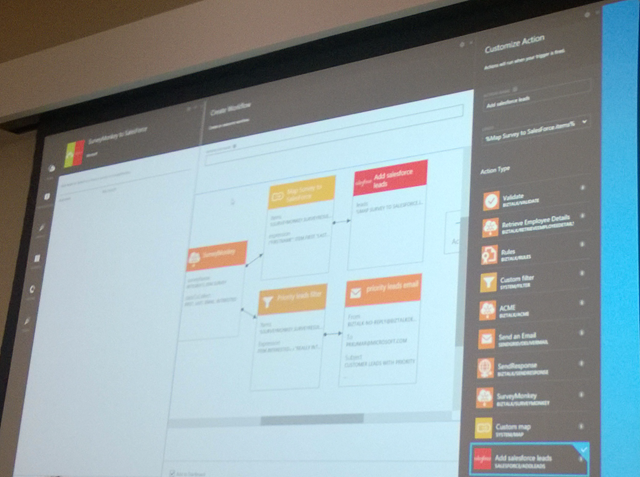 In reality, this re-imagination of BizTalk Services won’t really be a separate Azure offering – in fact, it’s more like the BizTalk capabilities are being exposed as first class capabilities within the core Azure Platform. Every developer that leverages Azure in any way could choose to pull in (and pay for) only the specific capabilities BizTalk Microservices they need – at the same time that same developer has a framework that allows them to build their own microservices and deploy them to a platform that enables automatic scaling & load balancing, and also provides monetization opportunities. The following BizTalk features were presented as candidates for implementation in the form of microservices. It definitely all sounds familiar. I remember a certain talk with Tony Meleg at the helm presenting a similar concept a few years back. This time, it looks like it has legs in a big way – inasmuch as it actually exists, even if only in part – with a public preview coming in Q1 2015. So What Are Microservices Anyway? Fowler further features a sidebar that distances microservice architecture from SOA in a sort of pedantic manner – that honestly, I’m not sure adds value. There are definitely shades of SOA there, and that’s not a bad thing. It also adds value to understand the need for different types of services and to have an ontology and taxonomy for services (I’m sure my former ESB students have all read Shy’s article, since I’ve cited it to death over the years). Yeah, But How Are They Implemented? Right now, it looks like microservices are going to simply be code written in any language* that exposes a RESTful endpoint that provides a small capability. 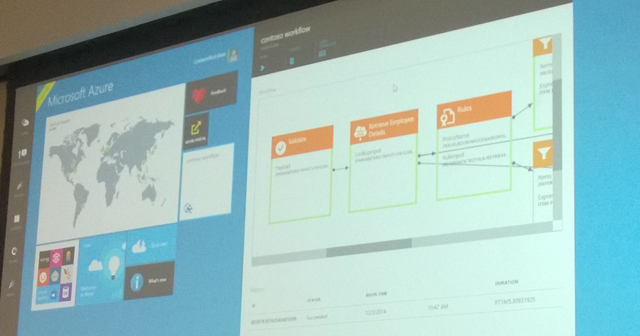 They will be hosted in an automatically scaled and load balanced execution container (not in the Docker sense, but instead Azure Websites rebranded) on Azure. They can further be monetized (e.g., you pay me to use my custom microservice), and tied together to form a larger workflow. Yes, I did just use the W word, but it’s NOT the WF word surprisingly. XAML has no part in the workflows of BIzTalk vFuture. 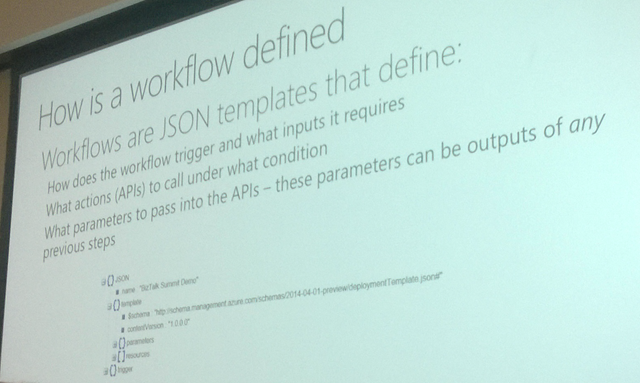 Instead, we have declarative JSON workflows seemingly based on those found in Azure Resource Manager. That is, the share the same engine that Azure Resource Manager uses under the covers, because that engine was already built for cloud scale and has certain other characteristics that made it a good candidate for microservice composition and managing long running processes. They can be composed in the browser, and as shown in the capture above, they can also be monitored in the browser as they execute live. I’m really keen on seeing how long-running workflow is a thing when we’re chaining RESTful calls (certainly we don’t hold the backchannel open for a month while waiting for something to happen) – but I may be missing something obvious here, since I just drank from the fire hose that is knowledge. What does the Designer Look Like? However, it also provides for custom workflows built from BizTalk Microservice activities microservices composed within a browser-based UI. It was presented as if it were going to be a tool that Business Analysts would ultimately use, but I’m not sure if that’s going to be the case up front, or even down the line. The tool is definitely pretty, and it was prominently featured in demos for talks throughout the day – even though quite a few pieces of functionality were shown in the form of PowerPoint Storyboards. So How Do We Do Map EAI Concepts To This New Stuff? Well, we have special entities within this world called Connectors. They are our interface to the outside world. 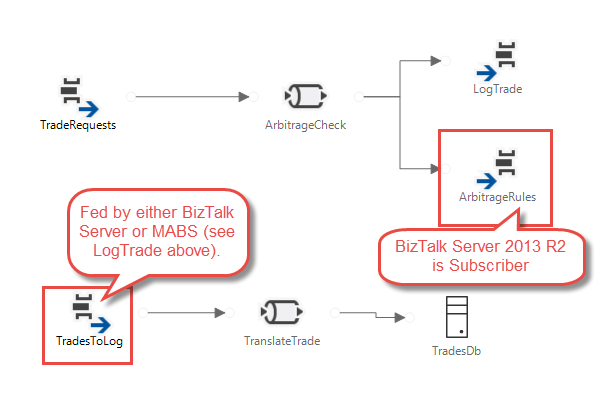 Everything else within the world of the original MABS 1.0 and even BizTalk Server is seen as simply a capability that could be provided by a microservice. So That’s the Cloud, What’s on-Prem? In the future – not yet, but at some point – we will see this functionality integrated into the Azure Pack alongside all of the other Azure goodness that it already brings to your private cloud. But remember, this is all still in the very beginning stages. We’ve yet to hear much about how really critical concerns like debugging, unit testing, or even team development, differencing / branching / merging / source control in general are going to be handled in a world where you’re building declarative stuff in a browser window. So that’s all fine and good for the future, but what about my BizTalk Server 2013 R2 stuff that I have right now? Well keep doing great things with that, because BizTalk Server isn’t going away. There’s still going to be a new major version coming every 2 years with minor versions every other year, and cumulative updates every 3 months. What about my investments in Azure BizTalk Services 1.0? Well it’s not like Microsoft is going to pull the plug on all of your great work that you’re actively paying them to host. That’s monies they are still happy to take from you in exchange for providing you a great service, and they will continue to do so under SLA – it’s a beautiful thing. Also, if you’re moving to the new way of doing things, your schemas and maps remain unchanged, they will move forward in every way. However, you will see a new web-based mapping tool (which I simply lack the energy at the moment to discuss further for this post). However, future investment in that model is highly unlikely based on everything announced today. I’m going to let this statement stand, because it was opinion at the time I wrote it. That being said, read this post before formulating your own. I hate to keep coming back to patterns here, but I find myself in the same place. 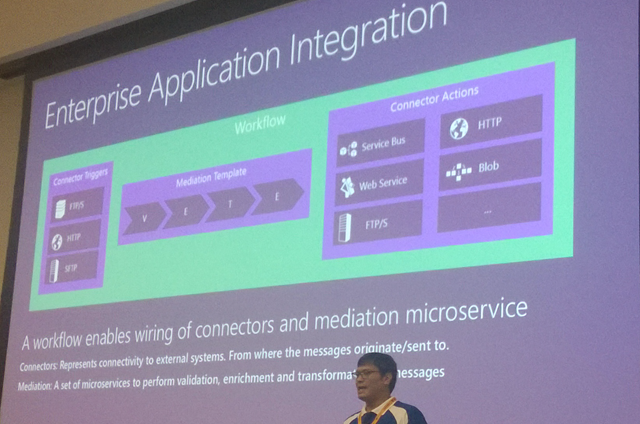 I will soon have yet another option available within the Microsoft stack for solving integration challenges (however, this time it’s not a separate offering, it is part of the core stack). At the same time, the problems being solved are the same, and we still can apply lessons learned moving forward. Also, integration problems are presenting themselves to a larger degree in a world of devices, APIs everywhere, and widely adopted SaaS solutions. 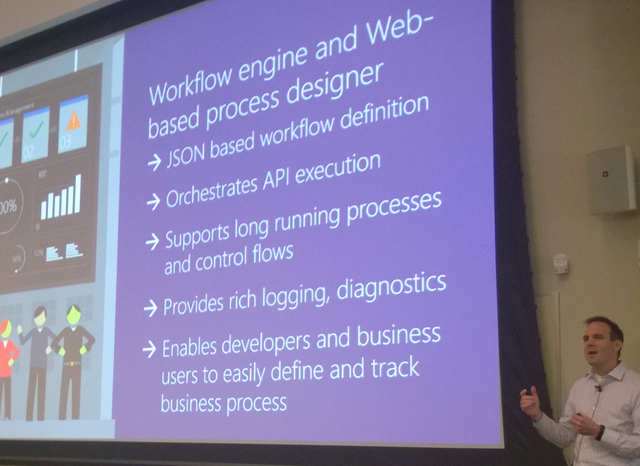 It’s an exciting time to be a BizTalk Developer – because after today, every developer became a BizTalk Developer – it’s part of the core Azure stack, every piece of it. For those that have been around the block a few times, the wisdom is there to do the right things with it. For those who haven’t, a whole new world has just opened up. * With regards to the any language comment – that was the statement, but there was a slide at one point that called out very specifically “.NET, Java, node.js, PHP” as potential technologies there, so take it with a grain of salt. It looks like the reason for that is we’re hosting our microservices in a Azure Websites hosting container that has been bebranded. ** Still waiting for some additional clarification on this point, I will update if my understanding changes. Updated in red.